← I Now Am Accepting Payments Online via Dwolla. Exciting News – BlogTalkRadio Show Coming Soon! I’ve been busy this past month writing several drafts of posts for this blog, taking a live 3-week online course with John Holland through HayHouseRadio, participating in several online business webinars, and simplifying my creative/writing blog. Still in the process of editing my posts for here and simplifying the other blog but getting things done. My mind has assimilated a lot of information, especially so in the last several months and it’s time to take action. I know I’ve been lax about the blog part of this site and I’ve tried to figure out why. 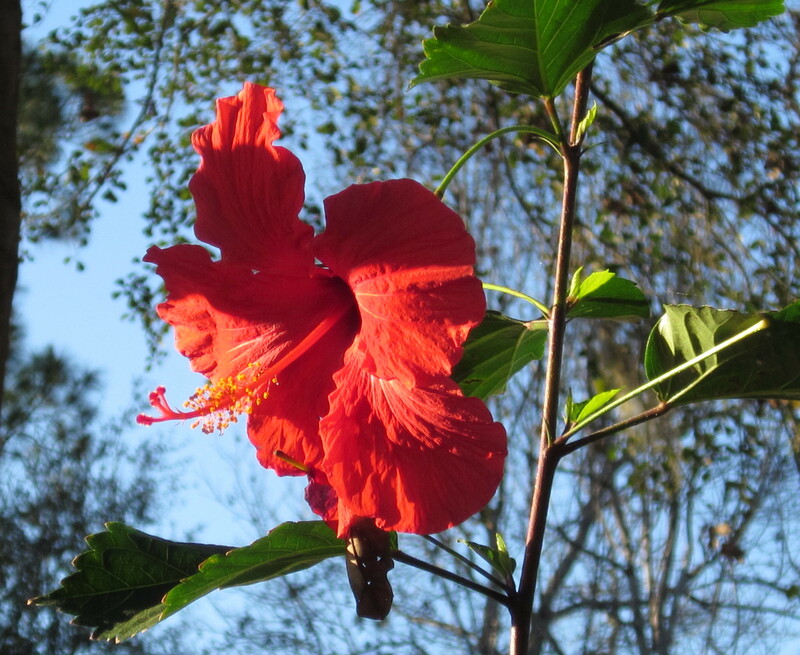 This gorgeous Red Hibiscus bloomed during a warm day in winter! January to be exact. What am I waiting for? I think, originally, I simply wanted a landing site to refer people so they could learn a little about me and my abilities and a place where they could contact me. However, while writing some drafts of future posts, I realized it may become more than that and I had to ask myself if that’s what I wanted. I believe the answer is ‘yes’. I think there was also a degree of fear of continuing to put myself and my experiences in this field out there for all to read about and, perhaps, judge and ridicule but I received so many positive comments here and on Twitter, it helped me decide to continue sharing. I must admit that I’ve needed to take some time to accept the unexpected positive response and figure out how to deal with it. I feel like that’s what I’ve done my entire life: absorb information. I’ve read so many books/articles/posts and listened to online webinars about self-improvement, self-discovery, self-care, business growth, authenticity, and more over the course of my lifetime. I’ve assimilated the information, took what works for me and retained the information to pass on in the hopes of it helping someone else as well. This is one major thing I love(d) about coaching people. Tapping into what they need to hear or giving them just the ‘right’ resource and tool to grow. So, with that said, my goal is to post once a week, not sure if it will be a scheduled day or not. Scheduling something like that doesn’t always work for me so we’ll see if a pattern emerges. Second decision I made is this: I have set up a BlogTalkRadio show, appropriately called Messages From The Other Side (I like to keep things simple), and will be having my first show this week sometime. What day and time? Well, I think for the first week or so, I’m going to try a few different days and times to see what works best for me and what day/time works best for callers. I need people to call-in for this radio show to work. I don’t want to make it a one-way ‘teachfest’. I could but that’s not what I want. 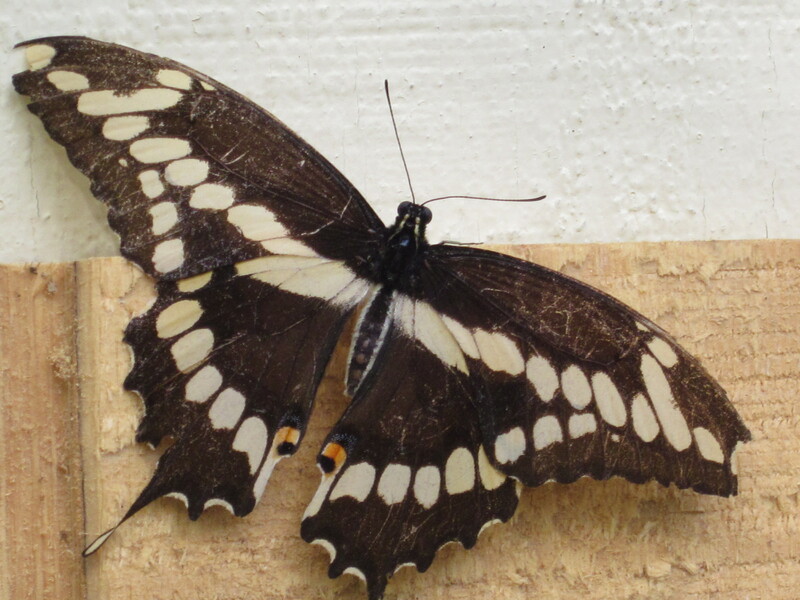 Like this Giant Swallowtail Butterfly, I’m ready to spread my wings and fly! 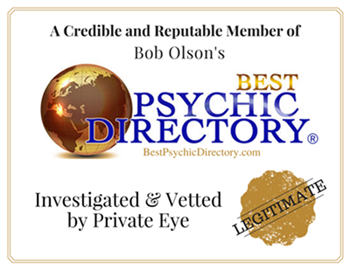 I had a BlogTalkRadio show for 14 months years ago helping people get hired: teaching people what information goes on a resume and what doesn’t, basic formatting, job resources, fine-tuning your job search and so much more. While I didn’t have a lot of people call in, it did receive more than 11,000 listens. I’m so glad people got a chance to listen to the archived shows. It’s a great platform plus, it’s a lot of fun! Also, I feel in order to help me make my transition of doing readings on a more consistent and daily basis, I want to step up my experience one-on-one. Will this work? I don’t know but I plan to have a lot of fun testing it out. As I point out in my opening script (I like to be prepared), if no one from the Other Side comes through, we can always chat about this field and I’ll be happy to answer any questions you may have. And, who knows? I may receive some information (maybe not from a loved one) but from one of your guides or mine that will be useful to you in your life. I truly believe my intuition has helped me offer just the right words, tools, or resources to people when I’ve coached them and maybe that will come through in the call. I’m pretty curious to see what will happen, are you? If you (or your friends and/or family) have a preference for a day or time to listen, please let me know. I’m on the East Coast so make sure you tell me what time zone you’re in. Are mornings best for you? Is lunchtime best for you? Or are afternoons or early evenings (before 7pm EST) the best? Please drop me a quick note in the comments below. This entry was posted in News and tagged BlogTalkRadio, Giant Swallowtail Butterfly, intuitives, messages from the other side, psychic, radio show, Red Hibiscus. Bookmark the permalink.